Use a can or juice lid to make a circle on the plain material (it could be any shape), cut 2 pieces. Cut out the same size circle of cardboard. 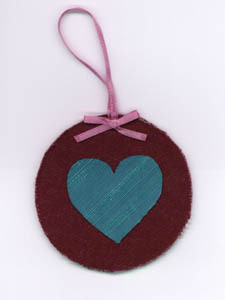 Look in a coloring book for Christmas or magazines for a shape to trace for the middle of your ornament (both sides). Trace the shape on to the patterned material. Cut out shapes and circles. Cut fusing material just a bit smaller than the shape and circle. Cut a length of ribbon to use as a hanger. Fuse each circle to the faces of the cardboard circle with the one end of the ribbon between the fusing material and the material at the top of the ornament on each side. Fuse the shapes to each side of the circles. Hang your creation on the tree!